After a bit of a hiatus from RITK we are back and I have some great recipes coming up for your reading pleasure in the next few weeks. It’s been a crazy last few months with lots of cake orders, some blog construction, and just general life business. Today’s recipe is one of my favorite snacks to make for parties, I hope you enjoy it! I’ll have a new recipe next week on the blog so, be sure to subscribe to RITK so you never miss a delicious post! I started making stove top popcorn as a way to make popcorn a bit healthier (this is way better than those microwave packets full of salt and fake butter!) I love stove top popcorn with just a bit of salt but after a while I thought of ways to make my snacks more savory and spicy. Today’s recipe is one of my concoctions to keep my snacks interesting. This recipe is also great to make in large batches, store in a airtight container and pack in lunches. So let’s talk about the method, below I will guide you through popping kernels on the stove, this is my favorite way to make popcorn at home and the method I use even if I’m not adding this sauce. I use olive oil although you can use sesame oil or coconut oil. After the popcorn is coated in spicy sauce, it goes into the oven to dry out. Before I added this last step I was eating soggy popcorn that required a few napkins, however drying the popcorn out in the oven cuts down on the messiness and also adds some more crunch. To pop the popcorn; I find it’s easier to do this in two batches. Start with a large-sized pot and heat 6 tablespoons of olive oil over medium-low heat. Heat until the oil is shiny and easily coats the bottom of the pan. Add 2/3 c of corn kernels to the warm oil and stir with a wooden spoon so that the kernels are evenly coated and spread out over the base of the pot. Cover and let the kernels pop (approximately 10-12 minutes). Stay close to the pot, if you don’t hear any popping within a 4-5 second interval it’s time to take the pot off the heat. Once the kernels are all popped remove from heat. VERY CAREFULLY, using hot-pot-holders, firmly hold the lid down on the pot while you flip it over 2-3 times. This releases the steam from the popcorn. 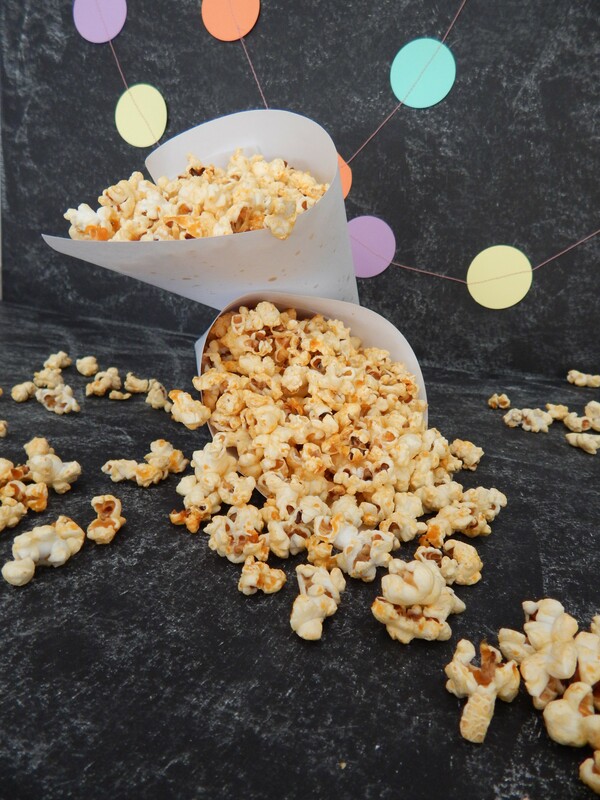 Next pour the popcorn into 2 shallow baking pans and pick out any burned or unpopped kernels and throw away. Next, in a small saucepan combine the hot sauce, butter, and sesame oil over low heat until well combined and makes a thin sauce. Distribute the sauce as evenly as possible over the popped corn (I like to use a combination of a slotted spoon and my hands). Then bake in the oven for 20 minutes. Store the popcorn in airtight containers or plastic bags.